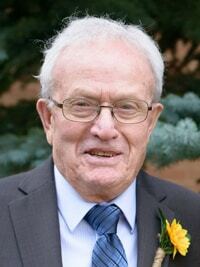 Rodrigue (Rod) Lalonde - Edmonton's Burial & Cremation Professionals | Trinity Funeral Home Ltd.
Rodrigue (Rod) Lalonde passed away peacefully October 12, 2018 at the age of 91. Rodrigue is survived by his daughters: Lyse Hayes, Huguette (Doug) Beckett, Chrystine (Robert Mantey) Lalonde as well as 4 grandchildren and 3 great grandchildren. Rodrigue was predeceased by his loving wife of 58 years in 2014, Marguerite. I just found out about your Dad Huguette. I’m so sorry for your loss. Accept my sincere condolences and my thoughts are with you and your family. Rod was one of the good guys! We will miss him very much. Condolences to the Family! Thoughts and prayers with the family. I feel blessed to have worked with Rod on many community events and became friends for so many years. Keep him safe in your hearts. I am so sorry for your loss. My deepest sympathy. My deepest condolences to the family. May God give you strength and peace at this time.